One of Australia’s most remarkable natural gifts, the Great Barrier Reef is blessed with the breathtaking beauty of the world’s largest coral reef. The reef contains an abundance of marine life and comprises of over 3000 individual reef systems and coral cays and literally hundreds of picturesque tropical islands with some of the worlds most beautiful sun-soaked, golden beaches.Because of its natural beauty, the Great Barrier Reef has become one of the worlds most sought after tourist destinations. 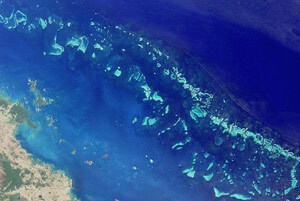 Discover more about Australia’s greatest natural wonder, the Great Barrier Reef. Queensland is unique amongst the Australian states in that it has a number of genuine coastal capitals. This sense of individuality has made cities like Cairns, Townsville, Rockhampton, Mackay, Bundaberg and Maryborough independent centres which do not rely on Brisbane. Great Barrier Reef Towns. Great Barrier Reef has over 100 islands, from unique and exotic islands to the Whitsundays and the remarkable Northern Islands. 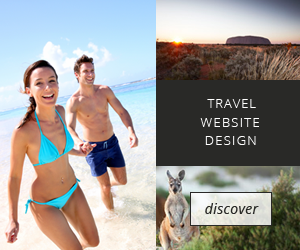 The islands of the Great Barrier Reef will redefine your idea of paradise. Cairns is the perfect destination from which to explore the many wonders of the Great Barrier Reef. The unspoilt islands and beaches, spectacular wildlife and the pristine scenery of the surrounding tropical rainforests – all accessible from Cairns. 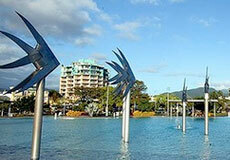 Cairns has many great hotels and resorts to suit any budget. Hotels In Cairns. Looking out at the Whitsunday islands, Peppers Coral Coast Resort has been purpose-designed with wide verandas and incredible panoramic ocean views to enhance the tropical lifestyle North Queensland is envied for. Peppers Coral Coast Resort offers the most stylish and elegant accommodation in Airlie Beach with 102 luxuriously appointed one, two and three bedroom apartments and three two-storey houses. Stay at Peppers Coral Coast Resort. If you are a certified diver, new to diving or a snorkeller, the Great Barrier Reef has some of the best ocean life in the world. Diving the Great Barrier Reef. To get a complete grasp of the sheer magnitude of the Great Barrier Reef, you need to let your feet leave the pure-white beaches and take to the air! See the reef from the air.